But that school gets me on an emotional level that few buildings do, solely from all the amazing memories attached to the place. For example, on “Senior Skip Day”, when I threw a water balloon into a classroom, and it whizzed past the teacher’s head and went straight out an open window, not exploding on anything! In fact, the teacher didn’t even know it happened. But all the students saw it and completely broke out laughing. Apparently quite a few other people felt the same way I did, and Jeanie Goddard, a retired Wellesley High English teacher, decided to put together a “last hurrah” celebration for everyone. Now as luck would have it, on my last visit to Wellesley, in June, some friends and I decided to take our own little trip down memory lane ~ and thank God we did. Walking through that high school was like a trip back in time. Virtually nothing had changed, except us. 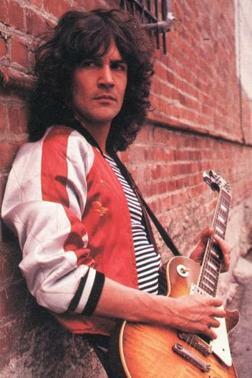 “Rock singer and guitarist Billy Squier, a 1968 graduate of Wellesley High School, helped the school “turn out the lights” Saturday night, playing old hits like “In the Dark” and “Everybody Wants You” before a packed house at the WHS auditorium. Tickets to the event sold out quickly after “The Swellesley Report“ noted on Nov. 4 that Squier would be appearing and local press tripped over each other in recent weeks to interview the singer. My friend Ellen Dixon and I used to walk home from school, right by Billy’s house. This was our “brush with fame”, although we didn’t know it at the time. [From Boston.com] Turn Out the Lights, a week long celebration of “the old” Wellesley Senior High School, began on November 20th with a presentation in the Wakelin Room at the Wellesley Free Library. The library presentation included a video depicting the architectural history of the school, which was built in 1938. Other events include a panel discussion on US foreign policy with distinguished alumni in the school’s auditorium. On the 22nd, there was a special acknowledgement of former football players, cheerleaders, band members and twirlers during the traditional Thanksgiving game against Needham High, which started at 10 a.m. Thursday at Hunnewell Field; a dance featuring “music through the decades’’ in the school’s cafeteria on Friday evening; and an open house and yard sale at the school Saturday from noon to 4 p.m. that included old uniforms, locker fronts, pompoms, and banners for sale. For photos and details on the celebration, visit www.wellesleycelebrateseducation.org. This entry was posted in Cultural Events, Flashbacks, Historic Preservation and tagged billy squier, massachusetts, turn out the lights, wellesley, wellesley high school. Bookmark the permalink. Your memories had me laughing. Liked your last comment: nothing changed but us. 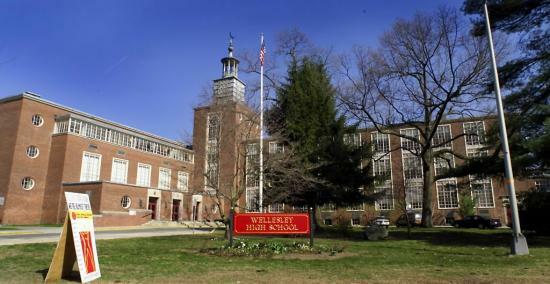 I’m also an alumnus of Wellesley High, and it was painful to see her go. I attended the Lights Out ceremony and took about a hundred pictures when I was at the last Thanksgiving Day game. Interestingly enough, there’s a highschool right down the street from me that has a nearly-identical design, Matignon High School in Cambridge.